Just when you think you have everything under control life throws you lemons. You know that you can’t spend more than you earn but inside your head you say it’s ok to spend a bit more because you are worth it. Sure you could spend cash if you have extra money and no debt like us but it’s also important to realize why you are budgeting in the first place and whether your budget needs to be tweaked to fit your lifestyle. In September we thought for sure that expenses would cool down a bit and they did for October just not as much as we would have liked. As you will see below we didn’t save a whole heck of a lot of money in our savings account but we did manage to balance the budget as per usual. I had to spend money for work as well we bought a universal home gym second-hand which cost us a bit of money. I have some gym equipment that we have been using but I wanted more weights and the system was a great price so I wasted no time picking it up. I’m looking for a couple of benches now and more free weights on a rack so hopefully I can score a great deal. I think that if you want to get healthy it doesn’t have to be expensive and you don’t have to always join a gym to do it either. October was filled with special occasions for us and we spent more money than we should have and like everyone else feel the crunch come budget time. Our grocery game challenge has a rendezvous account built-in for any romantic getaways that the wife and I might want to take. If there is extra cash but we are thinking about a once a month date night come 2014 and a section in our budget for that or simply move more money into our entertainment budgeted section which may be easier. The problem with the rendezvous account is that it hasn’t been building up much money so it might take us forever to go out on a date if we have to wait to spend less in our grocery budget for a few extra bucks here and there. I have this bad habit of wanting to buy my wife nice things and although I have been successful sticking to our budget the last couple of months I’ve gone a bit hog-wild. I also think that now that we have the mortgage pretty much paid for we are pulling back a bit from the budget to let loose although that could be detrimental if we are not careful. We vowed to keep November simple and stay away from shops we don’t need to go in unless necessary. Getting back on track financially is difficult and no matter how much you make, save or spend you can fall at any time. Be cautious. How do you budget in romance? I know I also briefly talked about how we were going to watch our budget numbers over the different seasons to see if the weather affects our spending habits. I’m almost sure that when it starts to get a bit nippy out that shopping starts to fill our heads, especially with Christmas just around the corner now. No, we haven’t put the Christmas decorations up yet but we have been in the malls looking around which has cost us some coin because I love my wife and love to see her happy. We have also started buying items for our home renovation so you will start to see our home maintenance numbers going up. We save money in our projected expenses every month for this purpose but we are pretty sure we will have to save more next year with the upgrades we would like to make inside our home. Nothing is cheap when it comes to renovating your house so we aim to do the best we can over time. Some people like to do the whole lot of renovations at once but we like to save then do the work. I know we don’t typically have any out of pocket expenses health insurance wise but on the odd occasion we have to pay a bit for prescriptions that might not be covered under my immaculate plan with my work benefits so we spent a few extra dollars in that category this past month. 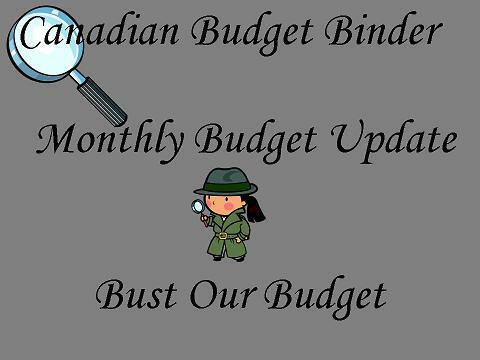 The 2 Budget Spreadsheet versions are as follows below but I will be updating the below budgets for the 2014 year in December based on any issues that might come up from all of you so please take a moment to download the budget of choice and let me know how it goes and any further feedback you can give me. I’m always open to feedback but be polite as you don’t want to hurt my feelings lol. I’m a sensitive guy you know. Budget 2-Everything is pre-set so you have to use the pre-defined categories but this budget will generate year-end budget figures whereas the other one won’t but you must use the categories already in this budget. If you change anything you will mess up the formulas and year-end figures. Please read all notes left around the budget for tips. No major changes to the budget happened for October 2013 or anything major before now and January unless we have the mortgage money in Canada in which case the mortgage will be paid in full. Our savings of 14.95% includes savings and investments. 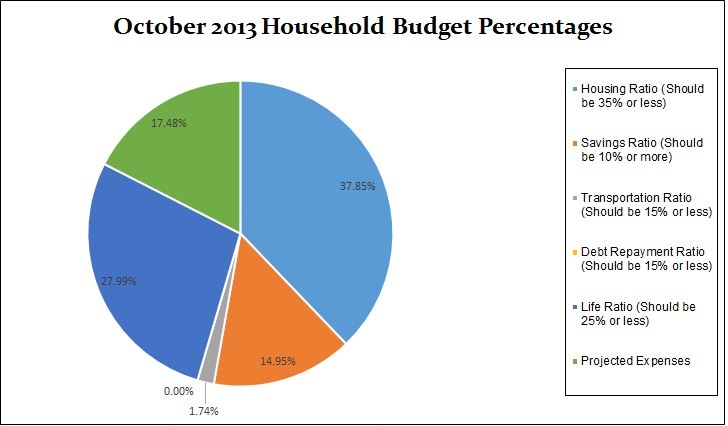 I’ve also went ahead and added in our projected expenses this month at 17.48% which brings the total October 2013 Household Budget Percentages to 100%. This is simply a breakdown of our expenses which has helped us to understand where all of our money goes. I appreciate that you enjoy this budget update each month but I do hope you view this as an educational tool rather than comparing your own financial numbers as we are all unique. Sometimes we wish we had more money to budget with but understand that we only have what we earn and if we want more, we need to earn more. Spending less than we earn and budgeting our money has been the easiest way for us to pay down debt and save money. If for example our clothing category was a projected expense we have a budget of $50 per month for the two of us. If we spend $30 on clothes for the month that means we need to pull $30 from the projected expenses account to pay for this expense or we move only $20 to projected expenses for the month and leave the $30 in your chequing account. It’s up to you how you do it as I mentioned above. 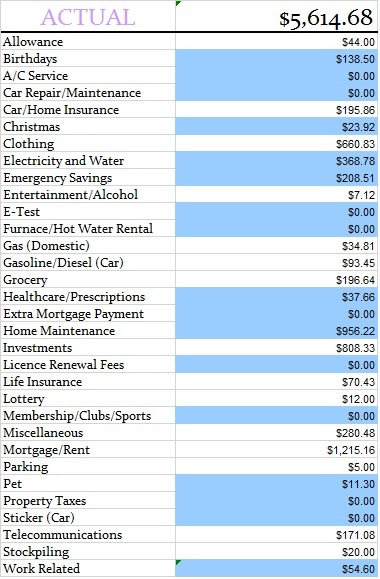 I’m hoping to put together a projected expenses spreadsheet to track the expenses all year-long otherwise you need to do that to make sure you don’t overspend what you haven’t saved or will save over the course of the year. It’s a fairly easy process and becomes a lifestyle change for your finances but the most important part is that the money is available and saved, which means potentially less stress. This means we should have $600.00 per year for clothing to spend. We have to track that expense as we spend it manually but hopefully for our 2014 budget I can incorporate that into our spreadsheet so it tallies the numbers up as we go along. That way we will be able to know exactly what we’ve spent as an ongoing total. 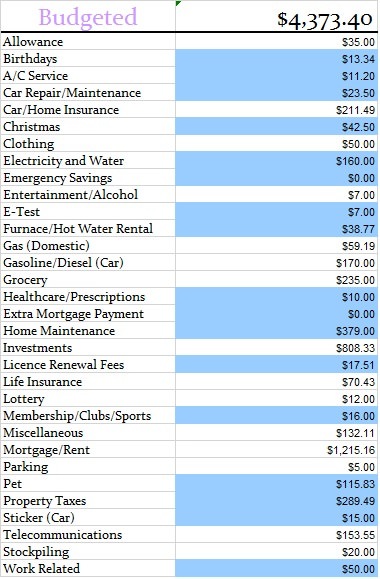 If it is highlighted in blue that means it’s a projected expense. You will see that the budgeted does not include the emergency savings. This is added in last after all expenses. That’s all for this month check back at the beginning of December with a new budget update and who knows maybe some good news. Let me get this straight, you call investment expenses?? Isn’t that not a choice you made. You can put the money into your savings account if you want. That is correct. If the money is budgeted into our budget then it is an expense. Sure we could put it into our savings and we would if we were in dire need of the money, however that is not the case. 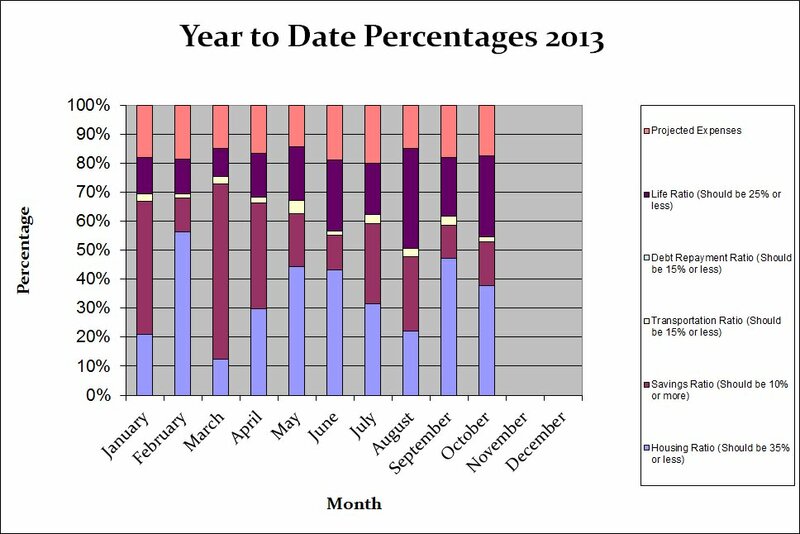 We do our best to beat our budget each month and try to improve in areas where we lack discipline. Thanks for dropping by Ronny. It sounds like you had an expensive October! We did too with our move and everything. I’m ready to get things back to normal now. Renovations are never cheap! I agree with saving up and then using the savings to complete them–and doing a lot ourselves. Organizing the basement and running more is also on my list too! Hey! Hubby and I havent had a real date night in almost two years 🙁 This month we splurged a bit with our bonuses…we went to a haunted house with some friends and went to see bon jovi 🙂 We figured after being at home for two years straight with the kiddies and both working full time we deserved it. One of our new years resolutions is to try and have at least one date night a month/every other month…..even if its just movies or dinner. Especially since our son will be two and much easier to care for. Budgeting in romance is hard, but we try to keep it simple. For instance, we went on a date this past weekend to Baskin Robins and it was a lot of fun. It only cost $12 for the both of us and we really enjoyed ourselves. Home renovations are expensive, no argument there. We have done a lot to this house and it still needs a lot. The joys of owning an older house. This one is either side of 100 yrs old I believe. We have lived in older houses most of our marriage. There are days I would like to be in something a little younger so we’re not always wondering what will need work next. For your bathroom, I might mention we got a new toilet in January for the downstairs bathroom here for under $200.00. It works very well and is a low flush… looks nice too. It came from Home Hardware. After trying to access your budget here I finally got the older boy to see what magic he could work for me so I can now access the spreadsheets and fiddle around with them. I hope to have something worked out by the new year. Hopefully by then we will know if/how much the older boy will get as a CPP-D payment so I can work with that figure as well. I have been tracking expenses for the last while and hopefully I can get both ends a little closer to each other than they are now. Getting both ends meeting in the middle is the target. We all have our to do lists and you are getting there on yours from the look of it. Not everything gets done in the time we think but we have our aims to work towards and you are doing well in that.I’ll be putting up our Christmas lights in the next couple of days as the parade is upcoming on Nov. 15 and I plug the lights in for that night only in Nov. The temperature look good this week so I should get that done. 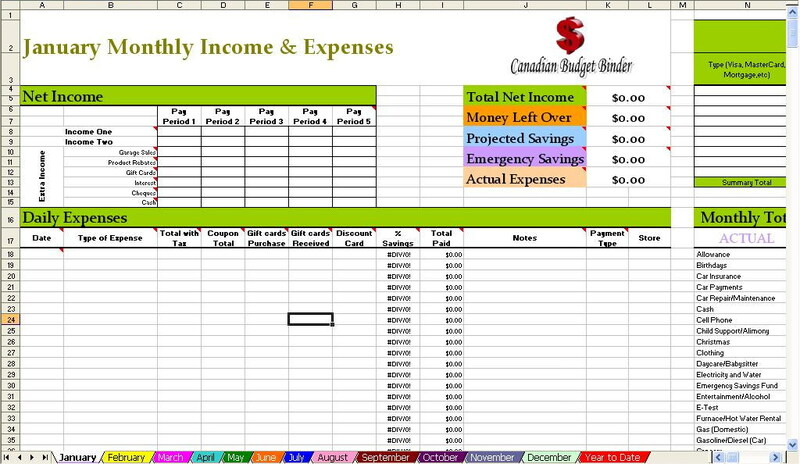 I must download that free budget spreadsheet, it’s very organized and you can easily track your income and expenses. Currently I’m only using cell phone application to track down my budget. Thanks for sharing this one! Mr CBB… hubby and I have always had a date night once a month. Sometimes we go out, sometimes we just aren’t available to the outside world. I set aside $10 every month for entertainment…we have almost $300 in there now in case we see a concert or something we wish to attend. If not, it just keeps growing until we do. Normally our coffee date nights come out of the cash from my bottle returns. I am with Juanita, reconnecting and really communicating with your partner are so key to he longevity and happiness of a relationship. A marriage is a living, breathing thing that requires time and attention if you hope to keep it healthy. I just broke down and bought new snow tires. We were going to try and go without this year, but we’ve been having some bad weather already, so it’s not worth risking. It does seem like it’s something every month. I think it’s nice that you like to treat your wife! If you were going into debt, it might not be fun, but you’ve earned it. I know what you mean about expenses on home renovations, Mr CBB. We just spent $700 on shelving this weekend as part of our grand garage renovations. It’s expensive, but we wanted a system that will be flexible and last us for years and years to come. I am happy to hear that you and your mr.s are planning to do a date night once a month!! I feel sometimes having time one and one is important and helps reconnect us as a couple and the day to day life takes a back seat just for a little while. It is also hard not to spoil the ones you love especially if they don’t spend the money on themselves to begin with! The past few years I have waited till my bday or xmas for the gifts/items I really want instead of throwing our budget outta whack just for my wants.